Florence Foster Jenkins was a legend. She still is, particularly among music students. I first learned of her from my college roommate, an aspiring opera singer. Jenkins, too, was an aspiring singer. The only problem was, she wasn’t any good. But she had an insatiable spirit. And an insatiable cast flow. It was the latter and not the former that allowed her to play Carnegie Hall in 1944. The tickets for that event sold out like hotcakes. Back in college, my roommate and I giggled over Jenkins’s recording of “The Queen of the Night” aria, and yet still felt a level of admiration for a women who wouldn’t let anything stop her, not even a lack of talent. Centerstage’s current production of Souvenir, directed by Vivian Matalon, gives us the woman in all her glory and horridness. Souvenir is basically a play with songs. It is told via a frame narrative. Cosme McMoon (Donald Corren) is in a piano bar, looking back on his job as the accompanist of Florence Foster Jenkins (Judy Kaye). Kaye get the more fun job, infusing Jenkins with a childlike innocence and impish energy that I defy you not to get sucked into. As McMoon, Corren is our representative on stage. 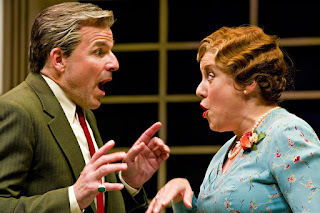 Jenkins surprises, amuses, and horrifies him, just as she does to us. 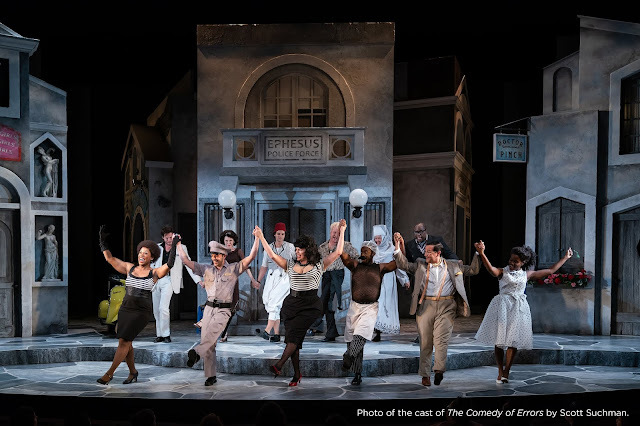 Baltimore audiences are quite fortunate that Matalon has managed to assemble the original Broadway cast for this production. Not only do Kaye and Corren know the roles, they know each other, and that strong relationship helps the play zip right along. They both have excellent comic timing. This is imperative, as the play is one-joke, a joke that with less talented performers would get tiring. The script is a serious of scenes in which every now and then Kaye sings in the most appalling way possible. But through these similar scenes, a deep affection grows between McMoon and Jenkins. In the end, he sees the beauty that Jenkins knew was there all along. A beauty that gets shared with the audience, as the play ends with Kaye singing “Ave Maria” as what it may have sounded like in Jenkins’s head, on-key, on-beat, and angelic.